It's the heart of summer here in Teton Valley, Idaho, and we're making the most of it. 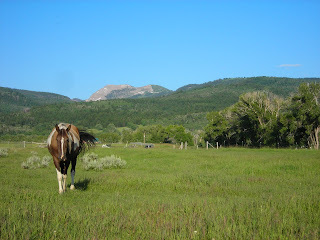 Nothing matches the variety available this time of year, especially in the mountains: horseback riding, biking, golfing, fishing, hiking, rafting, relaxing. Gotta love it all. 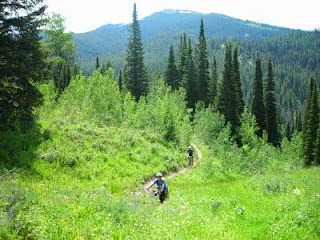 Joanne and I did our first epic backcountry mountain bike ride of the year last week, along with my buddy Eric. 6 hours of "out there" time, 5,000 feet of climbing, 25 highly-technical miles, three creek drainages, two broken spokes on Eric's rear wheel (which somehow held together), and about a million wildflowers. It was an extreme day, and insanely gratifying. I think I'll wait a couple of weeks before another effort like that, though. 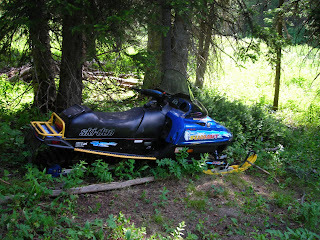 We spotted this abandoned snowmobile in no-man's-land (I told you we had a lot of snow last winter). If I pack it out, is it mine? Business took me down the road to Salt Lake City for a few days, and there were some good times. 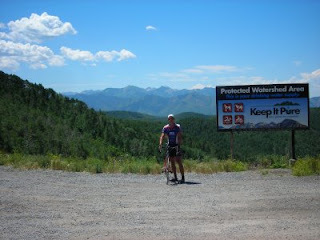 My cousin Brent and I escaped the heat one morning and did a great ride from the University of Utah to East Canyon, and back. Another 5,000 feet of climbing...and I wonder why my legs are wrecked. 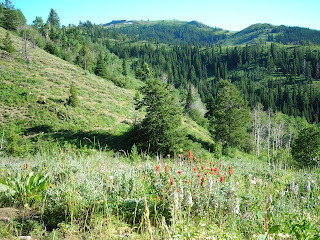 This photo is from the summit of Big Mountain, where the Great Western trail intersects and connects most of the Wasatch Range. Next time I'm taking my mountain bike, to explore some more. Back home in Driggs, Bridger and I did an evening hike up Pole Canyon and beyond. It's a favorite of mine, espcially once you crest the initial ridgeline and continue back in towards Fog Hill. It's great snowmobile terrain in the winter, abundant elk and moose habitat in the summer, and scenic year-round. The Indian Paintbrush wildflowers are really starting to pop up there now, too. 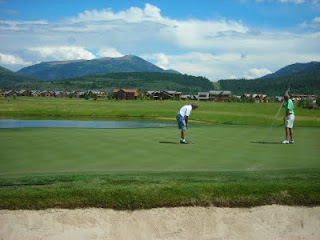 Adding some yin to the yang, I finished the week with a great round of golf out at Teton Springs. My friend Jon was nice enough to invite me along, where he and Sam soundly trounced me...but I enjoyed it nonetheless. How could you not, with scenery like this? Thanks, guys. Ahhh. Housetop in the background. Along Fox Creek. My Great Grandfather homesteaded that land in the 1890's. I was wish I had never left.